2.1 Notices to competitors will be posted on the notice board located at the ABYC Clubhouse. 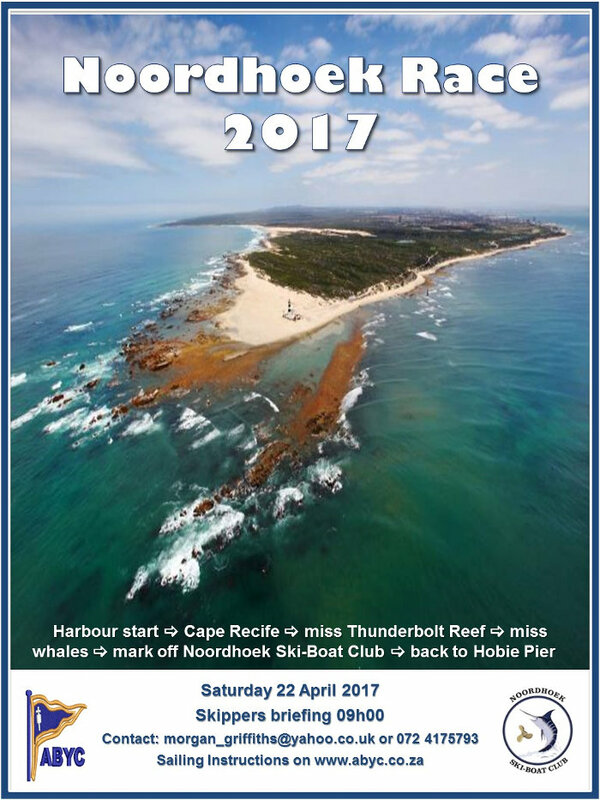 3.1 Any change to the sailing instructions will be posted before the Skippers Meeting at 09h00. 4.2 Familiarization of Chart SAN 1024. Boat Nav-instruments (depth) will be a big asset. 5.1 The course is: Harbour Start ? Cape Recife (CAUTION: Baratz wreck at 34°01’0.14”S 25°43’0.3”E) ? to pass Thunderbolt Reef to starboard ? mark off Noordhoek Skiboat Club (set in >10m water at approx. 34°2’42”S 25°38’45”E) ? to pass Thunderbolt Reef to port ? Hobie/Shark Rock Pier Finish. 8.1 Check-Out and Check-In Procedures, sign in and out as pet normal, and additionally you must enter your boat name on the day of sailing with the Race Officer.